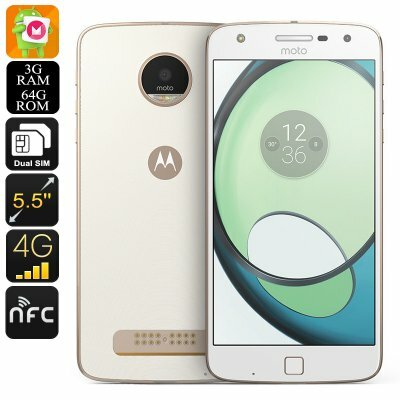 Successfully Added Lenovo Motorola Moto Z Play XT1635-03 Smartphone - Android 6.0, Octa-Core CPU, 3GB RAM, 4G, 2TB External Memory (White) to your Shopping Cart. The Motorola Moto Z Play XT1635-03 smartphone is a sophisticated Android phone that lets you smoothly enjoy all the latest features the mobile industry has to offer on its beautiful 5.5-Inch display. Running on an Android 6.0 Operating System you can be assured that this Chinese smartphone packs all the latest Android features you are familiar with, bringing along a fast and powerful experience. Thanks to the phone’s massive 3510mAh battery, you will now be allowed to enjoy all this Android smartphone has to offer for 5 hours constantly, getting you through the most demanding and media filled days without ever needing to worry about battery life. Packing the powerful Snapdragon 625 CPU, this 5-Inch smartphone is capable of dealing with the most demanding of games, movies, and applications out there. Built to provide a powerful and speedy performance, this Octa-Core CPU that has been clocked at 2.0GHz and is guaranteed to handle anything you throw at it without you needing to worry about slowing down your device. Additionally, the Motorola Moto Z Play XT1635-03 also holds 3GB of RAM, letting you engage in the most intense multitasking sessions as if it’s nothing. Whether you like to play graphically heavy mobile games, watch an FHD movie, or simply enjoy the benefits of the latest and most sophisticated mobile applications – this Chinese smartphone is sure to meet your needs. With 64GB of internal data storage, this Android phone offers plenty of space for you to store all your personal files and media alike. Additionally, this cell phone offers an absolutely stunning 2TB of external memory – providing you with so much space that worrying about storage will be an issue of the past. So head out to the Play Store or the internet and download your favorite movies, games, applications, and more – as with this Chinese Android smartphone at hand you’ll be able to carry along years worth of mobile fun and entertainment within your pocket. Additionally, the Motorola Moto Z Play XT1635-03 also supports 4G connectivity – providing you with the fastest mobile data speeds out there and allowing you to browse the web and engage in online games or stream movies whenever you want. Featuring an incredible 5.5-Inch super AMOLED display, this Android smartphone lets you enjoy all your phone’s features in truly amazing resolution. Supporting 1080p, you will be able to enjoy vivid colors and detail while taking the most out of all the features your smartphone has to offer. Additionally, this Android phone features Dual-SIM and IMEI numbers, further enhancing your user experience by allowing you to be reachable on two phone numbers while using merely one device. From now on you’ll be able to efficiently separate your work and private life and always be within reach to all your friends, colleagues, family, and loved ones. The Motorola Moto Z Play XT1635-03 Android smartphone comes with a 12 months warranty, brought to you by the leader in electronic devices as well as wholesale electronic gadgets..